Another of our makes from last year - this really is a gorgeous little indulgence at Christmas time but you could create one that isn't quite so seasonal and wear it all year round - even add that pocket I talked about last year. Here's the updated version from this year with the pocket on the front. Not overtly a Christmas pinny but pretty festive none-the-less and this print can be worn all year round as opposed to just for a few weeks each year. I love these fabrics - the main pocket and ties fabric is Flock and the background and binding is Sharks Tooth Orange by Emily Herrick from her gorgeous new collection Rustique. To add the pocket onto the front you just need a further piece of fabric (Flock, on this version) which is cut 10cm shorter than the main fabric (sharks tooth on this version) and is then bound with bias binding along to the top edge and then laid over the top of the backing fabric (shark tooth) before the bias is sewn around the edges. Once bound I sewed a straight line up the front of the pocket to divide in into two and stop it gaping. An essential Christmas project for either yourself or the perfect gift for your holiday hostess if you're lucky enough to have someone else do the cooking! This is a really quick make that will get your Christmas sewing projects off to a stylish start. 2. Cut your main piece to the required 55cm wide by 40cm high. 3. take a cup or glass and use the curve to mark the bottom edges of the fabric. 4. cut round the line so you have a curved edge. Repeat on the other bottom corner. 5. Fold your fabric in half and cut a strip from each of the two outside edges by marking a point 5cm in from the outer edge and then cut off a strip diagonally to the top of the curved edge you have just cut in step 4. Your fabric will now look like this. 6. Create your bias binding by cutting the fat quarter into diagonal strips 5cm wide. 7. Place the mitred edges together, patterned sides facing as above (make sure they are slightly staggered as above or your bias will come out wonky!) and sew together using a small seam allowance. Repeat until you have created a strip at least a metre and a half long. 8. Iron flat and trim the little bits that overhang the line, shown above here. 10. ... and fold in half and iron again. Now you've made your length of bias binding. 12. 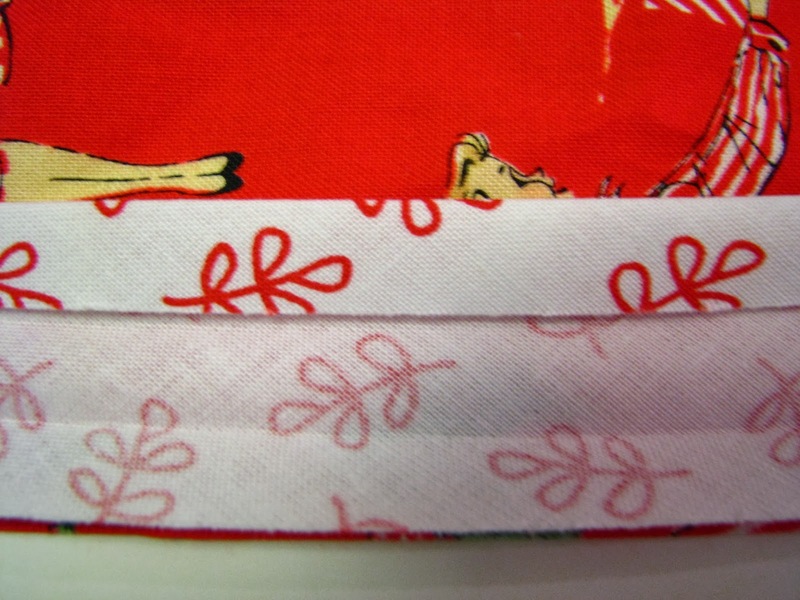 ...and place it on the side edge of the pinny, patterned sides of the fabric together. Sew all around the pinny making sure you stitch along the first folded edge of the binding (the folded line that appears closest to the edge as pictured above). 13. Flip the binding around your raw edge to encase it. 14. Fold the binding down neatly so that the raw edge is evenly encased with the last fold of the binding tucked in neatly. Sew this down close to the edge of the binding as above. Be careful when putting the binding around the edges. It will bend smoothly around the corners if you take your time! 15. You now have the front of your pinny complete! 16. Now onto the ties. Remove the selvedge edges and cut the fabric for the ties into 3 pieces measuring the whole width of the fabric (approx. 110cm) by 16cm deep. You will end up with 3 very long strips each 16cm deep. Sew these together to form one VERY long strip of fabric 16cm deep. 17. Iron the fabric length ways along the whole strip and then fold the edges to the centre and then in half again as per the binding. 18. Open the strip up again so that you can see the two edges meeting in the middle. 19. Fold a tiny strip over at the edge and press. 20. Fold the two corners in to form a point. 21. Fold the fabric back in half so that you have a lovely mitred end to your tie. 22. Find the middle of the top edge of your pinny and mark with tailor's chalk. 23. 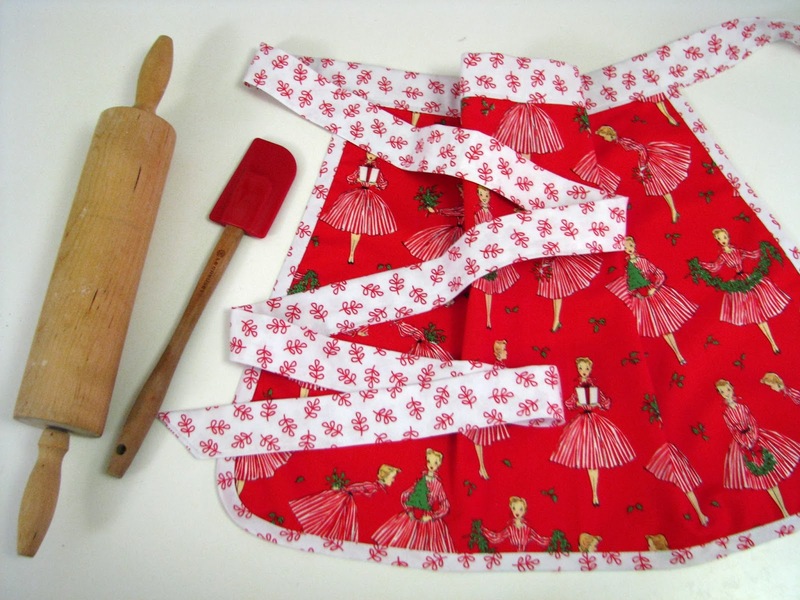 Match up the middle of your pinny with the centre of your tie and enclose the pinny within the tie. 25. ... and out along to the edges of the tie. 26. Start at one mitred end of the tie and stitch all along the edge, attaching the pinny as you go. 27.Et Voila - you're done! You could of course add your favourite type of pockets to this to make it practical as well as beautiful but we think the great big bow on the front is statement enough! Have a lovely week, bye for now!